NCLC volunteers are in the process of renewing a garden area at Circle Creek and transforming it back to its original purpose: a native plant nursery where seedlings intended for restoration projects can be grown. Join volunteer Pat Wollner for a short visit to the evolving nursery followed by a hands-on session with volunteer Jeff Roehm to make hypertufa pots. You can see finished pots in use at the nursery. At the end of the workshop you’ll have your own pot to take home. Hypertufa pots look like old stone but are far lighter (and less expensive) than stone or concrete pots. They are very durable and able to withstand extremes in weather. Lichens and moss may also grow on the outside, making them even more beautiful over time. JEFF ROEHM, a retired college administrator, is a long-time volunteer with NCLC, focusing mostly on stewardship. 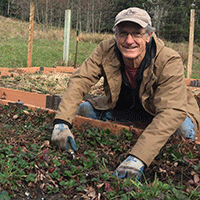 He serves as a volunteer site steward for several NCLC habitat reserves, but you might find him on any NCLC property where he can help plant, grow, or protect native plants. Jeff has been gardening with wildflowers and using hypertufa pots for more than 30 years. PAT WOLLNER is retired from a long career in nursing. She leads the NCLC Trails and Barn Team and is an active member of the Outreach Committee. 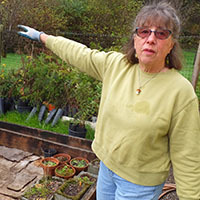 She helped to spearhead renovation of the nursery as well as the Rippet House at Circle Creek, which serves as a bunkhouse for summer stewardship interns. Workshop info: No toilets on site. Please leave dogs at home. Wear clothes that can get dirty and appropriate for the weather and working outside. What to bring: Water and snacks, gloves for handling wet cement/moss mixture, a container to shape your pot such as a 5-gallon bucket or cardboard box of a similar volume. Registration is required. Register online or call Lynette at 503-738-9126. To make payment, mail a check for $10 (made out to North Coast Land Conservancy, memo line “Hypertufa Workshop”) to North Coast Land Conservancy (attn: Lynette Villagomez) PO Box 67, Seaside, OR 97136. For more details, call Lynette.